From GIT Systems and LithoMetrix software to GeoSpec and ImaCore hardware and our P5 Overburden cell, all our software and hardware products are designed with ease of use and access to the latest innovations in NMR rock core analysis. GeoSpec core analyzers provide cutting edge solutions for the core analyst. The GeoSpec range of instruments is the result of a successful long-term collaboration between Oxford Instruments and Green Imaging Technologies (GIT), the world leaders in hardware and software for NMR core analysis. First introduced in the mid-1990s, the GeoSpec now has well over 100 installations worldwide in oil companies, service companies and academia. 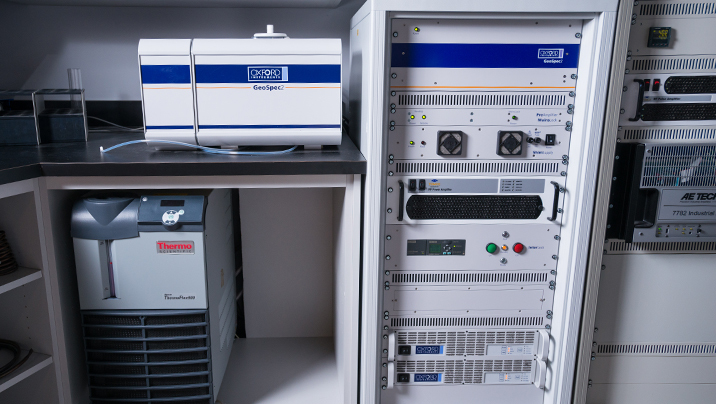 The GeoSpec includes instruments from 2MHz to 23MHz operating frequency, handling samples from ½ to 6 inches diameter, with integrated software and accessories to suit all users from routine core analysis to advanced petrophysics research. Entry level GeoSpec systems come complete with LithoMetrix™ software which carries out routine measurements such as T1 and T2 -based pore size distributions, porosity, and fluid mobility measurements such as Free Fluid Index (FFI), Bound Volume Irreducible (BVI) and Clay Bound Water (CBW). Higher performance hardware incorporating pulsed field gradients is matched with greater software capabilities of the GIT Systems software including measurement of hydrogen index, diffusion, and fluid typing by 2-D data mapping. Top of the range GeoSpec systems include saturation profiles, spatially-resolved T2 distributions, and GIT’s patented capillary pressure (Pc) measurement package, GIT-CAP™. GIT-CAP allows users to obtain Pc measurements 5 times faster, while getting up to 10 times as many data points per scan, compared to traditional measurement techniques. With the optional P5 Cell for overburden studies, users can perform analysis on 1” and 1.5” diameter samples at up to 5,000 psi of pressure and at temperatures to 100°C. All GeoSpec systems include Oxford Instruments’ revolutionary Q-Sense signal enhancement technology, which provides industry-leading short echo spacings (essential for measurements on tight rocks and shales, which have a high proportion of small pores) while maintaining high signal to noise ratios (SNR). This unique combination allows measurements to be made up to four times faster, with echo spacings several times shorter, than in previous instruments. Q-Sense also allows successive measurements to be made on cores of varying salinity, without the need to retune the probe between samples. The ImaCore 3D rock core imaging system is the result of a partnership between Green Imaging Technologies (GIT), an established leader in nuclear magnetic resonance (NMR) rock core analysis software, and MR Solutions, leader in magnetic resonance imaging (MRI) instruments. 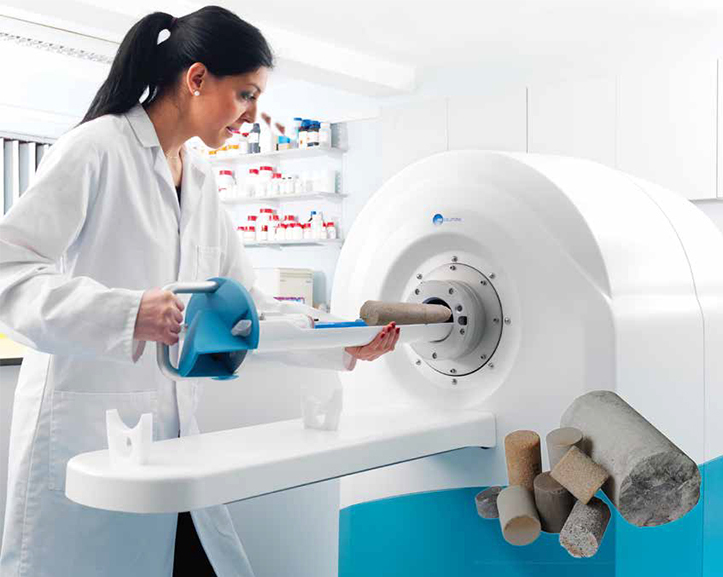 This partnership has resulted in a powerful MRI rock core instrument with an easy to use, yet robust user interface. ImaCore provides an adjustable field of 0.1 to 3 T in a stable, cryogen free imager, combined with industry leading 3D imaging software. 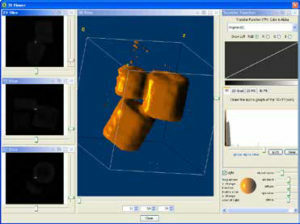 Users can quickly and easily obtain high resolution three dimensional (3D) images of all the fluid in the sample. Sample sizes can be standard 1” or 1.5” core plugs, or full 3” or 4” diameter core. The ImaCore flexible instrument design also allows for long core studies, and lends itself well to the use of flow cells within the instrument to perform flow studies. The flexibility of the ImaCore system extends to the magnet orientation; it is build on a rotating housing so that users can orientate the magnet horizontally or vertically. Complete the reservoir puzzle with an ImaCore 3D imaging system. 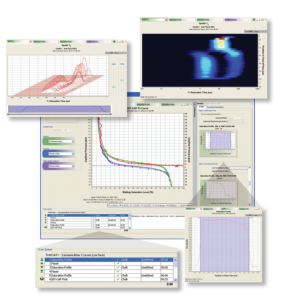 Green Imaging Technologies flagship software product provides users of advanced NMR instruments with access to more robust and exclusive measurements. This software includes acquisitions for standard NMR parameters such as T1 and T2, but also adds more advanced acquisitions such as those needed for capillary pressure, diffusion, 2D correlations maps, saturation profiles and 3D imaging of cores. GIT Systems Advanced – provides access to the most advanced measurements for high end NMR systems for production environments offering progressive measurements and for researchers working on state-of-the-art NMR applications work. GIT Systems Basic – Provides access to 2D correlation map and diffusion studies. GIT Systems 3D Imaging – Adds 3D core imaging acquisition, processing and visualization tools to the GIT Systems Advanced package. All versions of GIT Systems come complete with GIT App Builder, which is a development environment allowing users to build and test their own pulse sequences, or modify current sequences. *Patented, exclusive to GIT Systems. 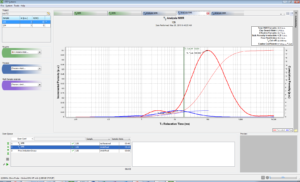 LithoMetrix software has revolutionized the NMR rock core analysis industry by providing an easy to use operating system for basic and advanced NMR core analysis systems. 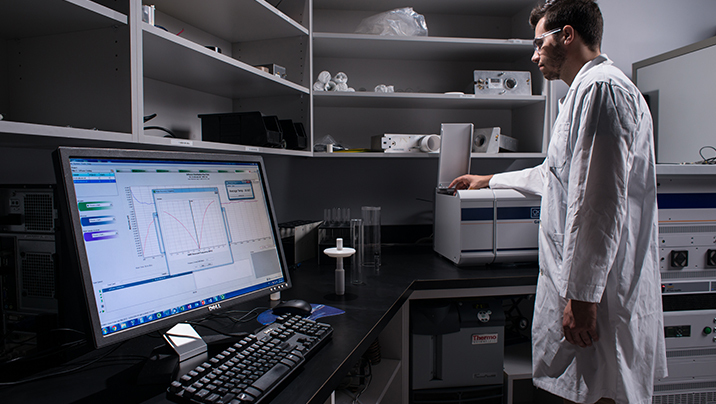 Green Imaging Technologies and Oxford Instruments offer a unique platform for NMR core testing. This seamless integration of Green Imaging Technologies’ software with Oxford Instruments’ leading edge rock core analysis instruments delivers unprecedented usability – an all-in-one solution for NMR rock core measurements. Learn more about the complete GeoSpec solution, click here. Need to perform advanced analysis? Seamlessly upgrade to GIT’s advanced SCAL software, GIT Systems. The GIT App Builder is a fully integrated sequence development environment that allows users to write pulse sequences, set parameters, run the sequence, visualize the results, and process data. No need to run several different software packages for programming, debugging, and visualization, the GIT App Builder lets you do all aspects of development in one environment. 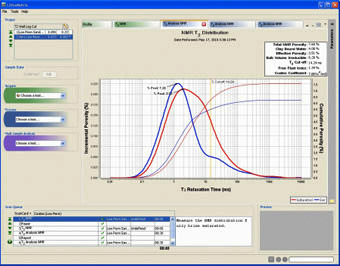 Users can build their own sequences or select from many built-in sequences including a CPMG, FID, and STE-Diffusion. Create your own parameter dialogs. Run sequences with real time visualization. 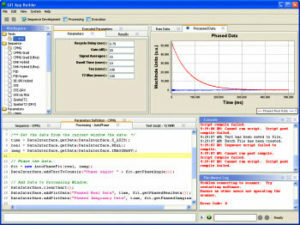 Use over 300 auto-complete functions to easily develop data processing scripts. Using the readily available visualization tools, the researcher can debug processing in real-time and process the data into meaningful results. Once new pulse sequence and data processing tools have been created in GIT App Builder, users can then package the new application into other software packages such as GIT Systems or LithoMetrix. Routine users can then run the newly developed tests without fail. Never before has it been easier to develop your own pulse sequences and package them in a useful way. The GIT App Builder is one more exclusive feature offered to clients using LithoMetrix or GIT Systems software, either packaged with the latest GeoSpec2 rock core analyzer, or with legacy hardware such as the Maran or Maran Ultra.